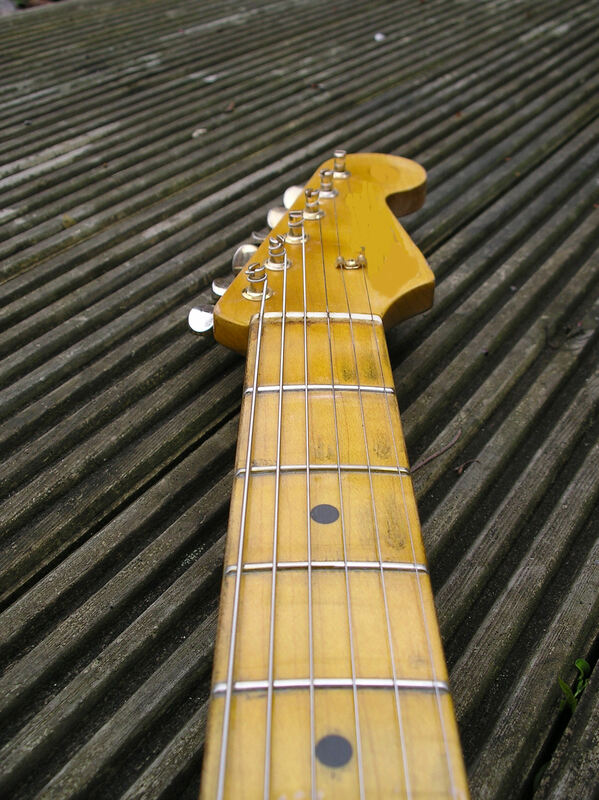 Here we have one of the nicest guitars I have built, a copy of a 1957 Mary Kaye, with gold hardware. I saw the piece of ash for the body and instantly thought Mary Kaye, not only is it one piece but it also has a stunning grain a rare combination and EXPENSIVE, but it's not often that these pieces of wood are available so I thought this was a rare opportunity to recreate a special guitar. From the beginning I wanted this guitar to be as close to original specification as possible so no expense was spared in getting the specification spot on. Here's some pictures to get started. 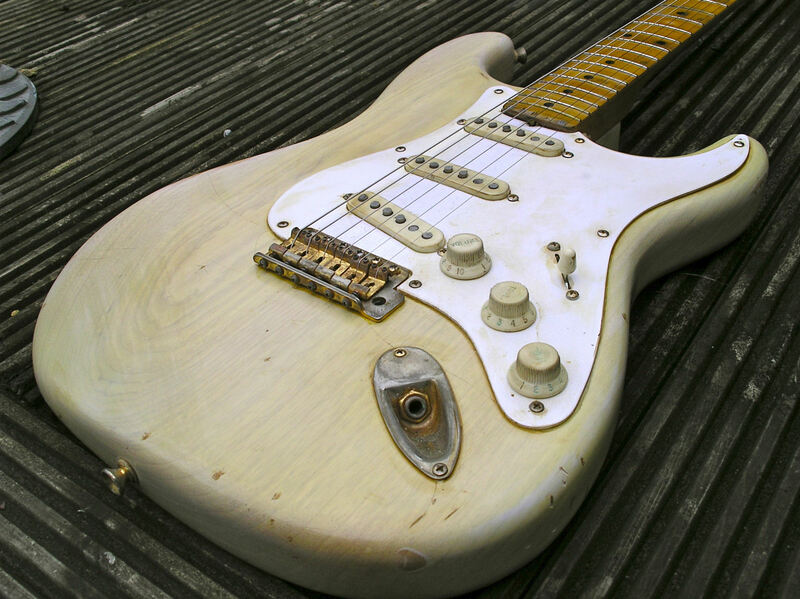 Here's the whole thing the almost white blonde finish showing off that lovely grain, the whole guitar has received the relic treatment but kept light, I wanted a loved and played look, so rather than lots of knocks and scrapes I've kept most of the wear consistent with 50 years of playing rather than abuse. The back, notice the aged springs and trem block, also the staining left after the trem cavity cover "went missing" , a few knocks have been added and only mild buckle rash also a little wear on the body contour. The neck has been kept clear of damage although there is the aged lacquer and greying of the wood. 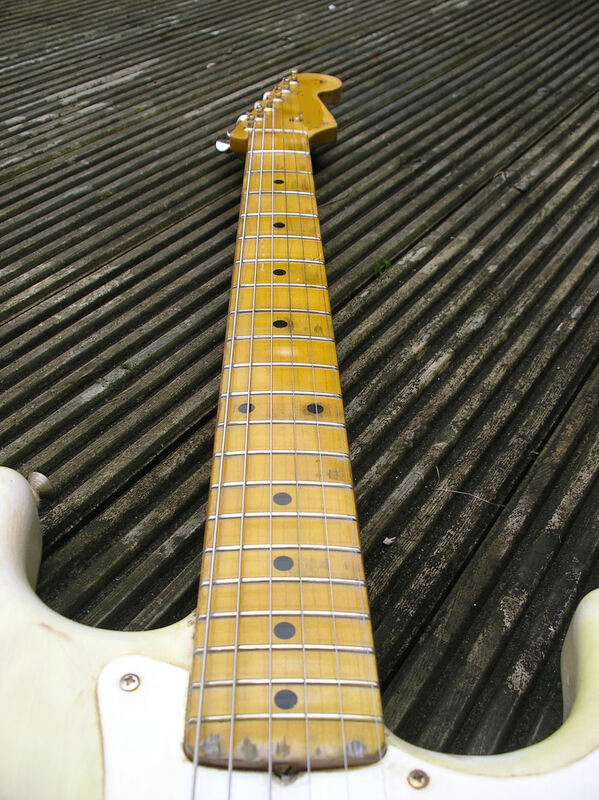 A nice close up of the body showing the aged gold hardware, worn plastic parts, notice also the green tarnished numbered tone and volume knobs. This view shows the subtle paint ageing, that's white and almost transparent where there has been wear, blending to a faded blonde, this shot also shows off the lovely grain of the ash. 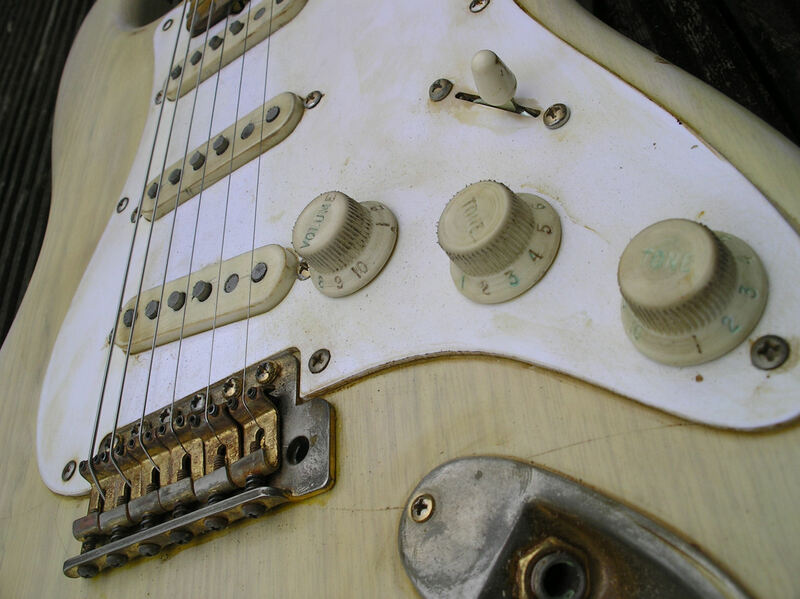 Here's a detailed shot of the gold hardware where the gold has been worn away and a little rust, also worn knobs pickup covers etc and dirtied pickguard. So pleased with the finished look of the fretboard... 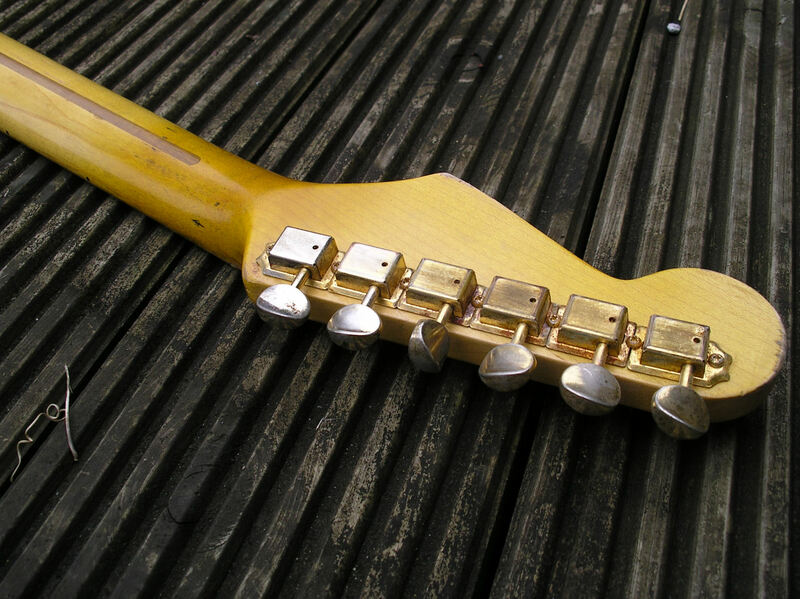 Probably my best maple neck finish to date. Rather than go for a contrived lookind wear marks I've kept it subtle with the wood and lacquer looking old. Ageing is not just skin deep.... 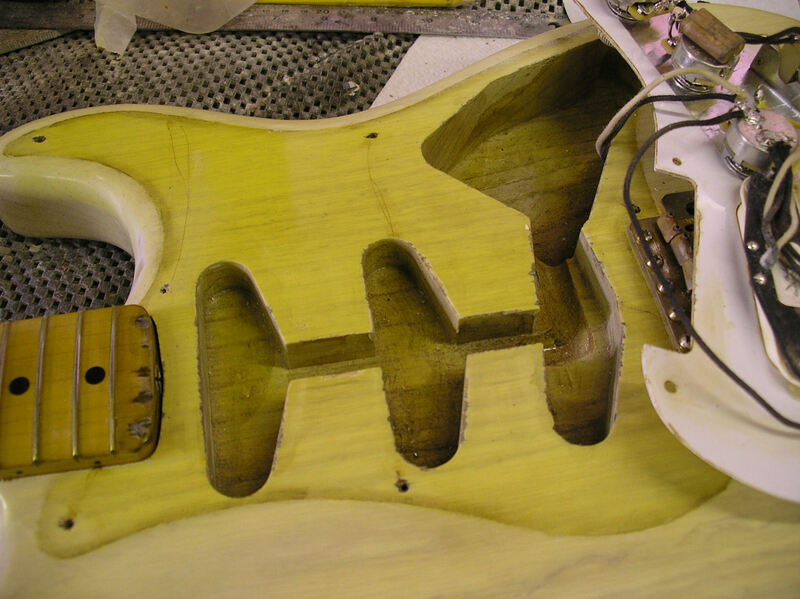 Under the pickguard, the edges of the jack plate, under the bridge and trem cavity have all received the ageing treatment . 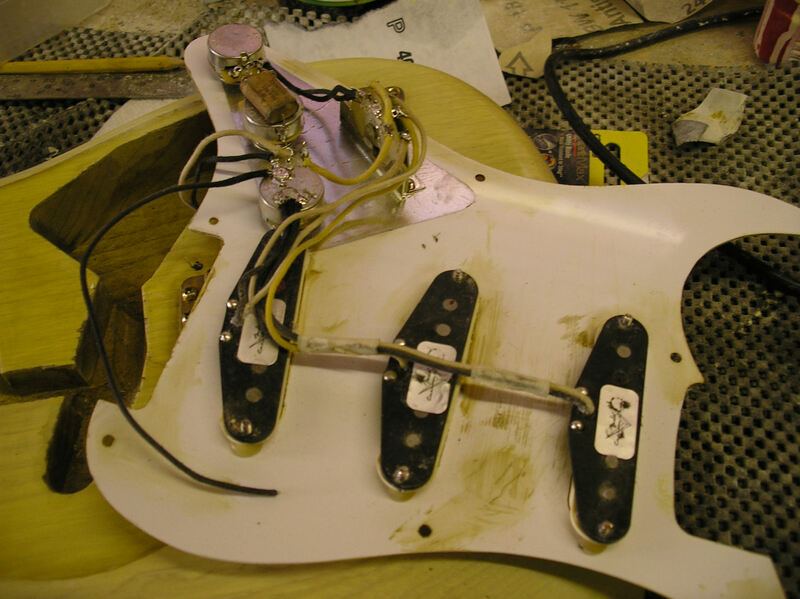 The under pickguard view... Note the remanufactured (F)Luxe capacitor (So now you can even go back to the '50s to play it, you just need a DeLorean....! ) Fitted are Texas Specials which I think are lovely pickups, all cloth wiring held with masking tape, CTS pots and CRL switch (5 position). So pleased with the ageing on the back of the neck which is subtle but not abused looking!...Also aged Gold Klusons. 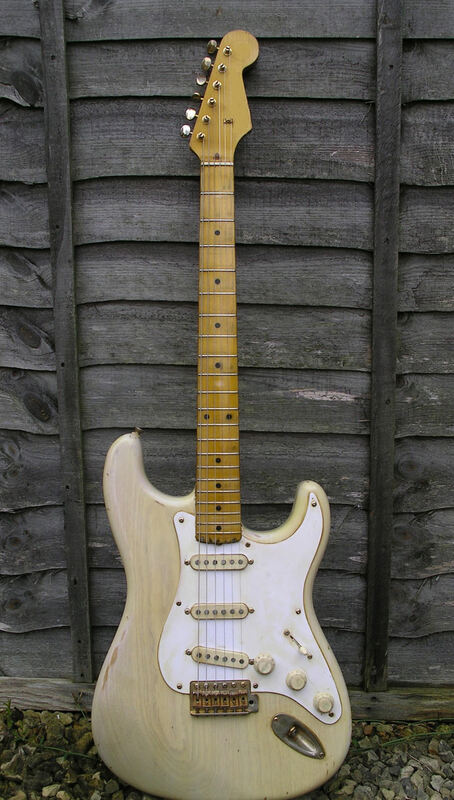 A couple of shots of the finished article, simply a lovely guitar made with all the best quality wood and parts I honestly think that you would struggle to get a better guitar anywhere. 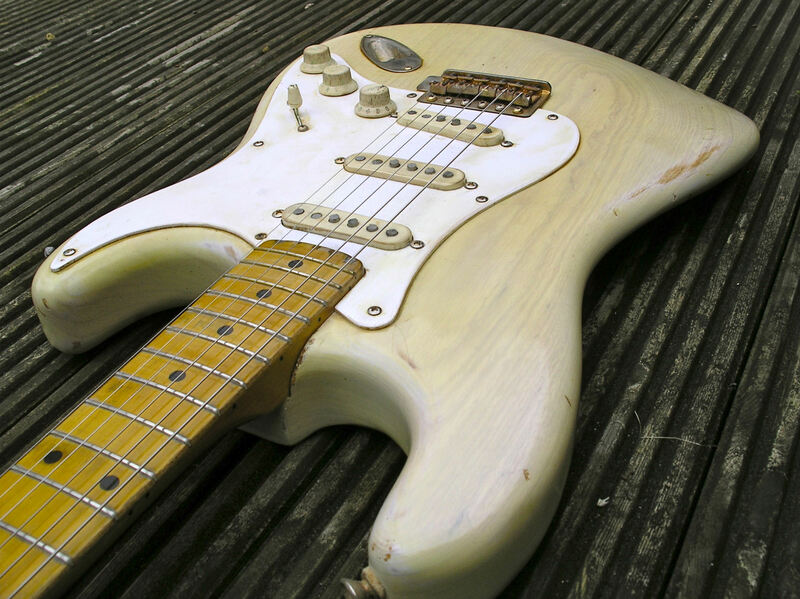 Finish... Vintage correct nitro cellulose blonde finish aged paper thin.